Ever wondered what sorts of foods the ancient Greeks ate? Here is a recipe for a healthful chewy snack that has satisfied and pleased children and adults alike for millennia. My Pasteli triangles - Click to Enlarge Image. 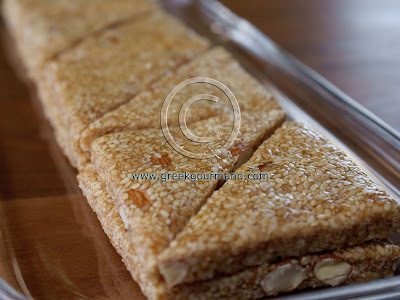 Pasteli, the mere mention of the word will bring a smile to any Greek’s face. An all natural confection, in its simplest form, pasteli is composed of two ingredients: sesame seeds and honey. The addition of nuts such as walnuts, pistachios, or almonds is also common in some versions of pasteli. Sesame has been an ingredient in the Greek pantry since time immemorial. Mention of it is made in Linear B tablets found at Mycenae dated to the 14th Century BC. Indeed, the English word “sesame” is itself derived from the Greek word σησαμη or sēsámē. This combination of honey and sesame seeds to form wafers of chewy wholesome goodness is one Greek food concoction that has been around - quite literally - for ages. In the Archaic age and later in the Classical and Hellenistic periods this confection was known as “itrion”. Indeed, it appears that among the ancients this type of flat-cake was a delicacy popular enough to warrant its own class of peddler, these were known as “itriopoleis” i.e., the ‘itrion-sellers’. 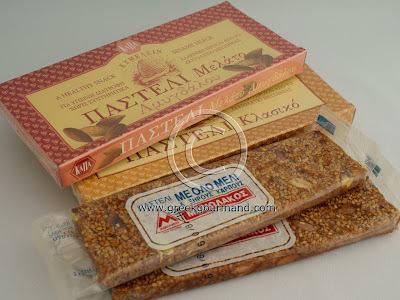 Some commercially available Greek pasteli bars - Click to Enlarge Image. Today, pasteli is inevitably included in the homeward bound luggage of Diaspora Greeks returning to their respective homes outside the fatherland. As a child, whenever some family member or close family friend returned to Canada from Greece, I always eagerly anticipated the pasteli that would have invariably been sent along for me by some relation back in the ancestral homeland. It is one of my most cherished childhood memories of travel to and from Greece. Pasteli is easy to make and keeps for long periods. It is also a very nutritious and fast-friendly or vegan snack. This most ancient Greek food item is a very popular treat for children in our modern era, and will likely continue to be enjoyed by all age groups for many more generations to come. Add the honey to a saucepan and heat over a medium low heat until it starts to bubble and ball. Add sesame seeds and almonds* (optional) to the pan and mix well to incorporate with the honey. Cook slowly while continually stirring the mixture with a wooden spoon until it achieves a rich golden-brown colour, about 10 minutes or so. Prepare a marble or glass cutting board surface by sprinkling it with some orange blossom water and spreading it to cover the working surface. Pour the hot honey-sesame mixture onto the working surface and spread it with a spatula to a uniform thickness of a ½ inch or so. Take a sufficiently large piece of parchment paper and cover the outspread pasteli mixture with it, then, use a rolling pin over top of the parchment paper to further thin and spread the mix into a rough rectangle of uniform thickness, about a ¼ inch or so. Remove the parchment paper (do not throw it out), square the edges of the pasteli with a spatula or icing tool and let stand to cool. Equally divide and cut the outspread pasteli into full-length rectangles using a large sharp knife. Further divide and cut the rectangles into squares, and then cut the squares at a 45 degree angle to achieve the triangular pieces depicted in the photo above. Use a metal spatula to remove the pasteli triangles from the marble/glass working surface and place the pieces in an airtight container (lined with the parchment paper from step 6 above) for storage. Do not refrigerate, simply store in the cupboard/pantry and serve the wafers as a snack, or dessert element. Note: You can also toast the sesame seeds and almonds/nuts in the oven before using them in this recipe. Simply spread them on a baking sheet and place them in a moderately pre-heated oven (350°F /180°C) for about 5 minutes or so. Make sure not to burn them. Enter the contest to win a free copy of a modern classic on Greek Food, “Culinaria Greece: Greek Specialties” by Marianthi Milona. To mark the first anniversary of this Greek food blog (as of January 30th! 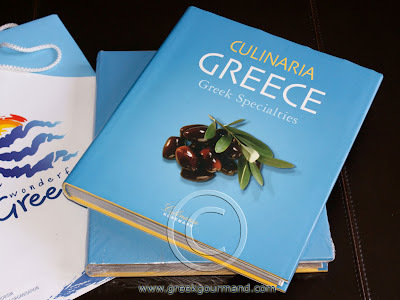 ), I thought it might be fun to institute a series of contests for my loyal readers; and what better prize for a Greek food blog contest than a book on Greek food? The Culinaria titles on national cuisines are among my favourite downtime reads and occupy a prominent position on my bookshelf. Whether I want to explore the ethnic foods of Italy, Spain, Germany, France, Russia, Hungary or Greece it is always a pleasure to pick up and flip through one of the books in this series. The articles, recipes, and photography are quite engaging and serve to immerse readers in the cultural contexts of the foods and beverages explored between their covers. 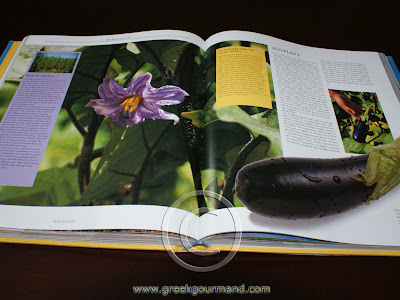 The Culinaria Greece book is quite impressive and would make an excellent addition to any food lover’s library. Details on the eggplant from within the book. Click to Enlarge Image. To enter the contest and win a copy of Culinaria Greece you will need to answer a series of questions; the answers for which are to be found throughout my blog within my past postings. When you have collected your answers, send them to me via email to greekgourmand[at]gmail.com (replace the [at] with an @). Be sure to include your name and mailing address in the message. The winner will be chosen randomly from among the correctly submitted entries at the close of the contest on March 31, 2009. Note: Your email/contact information will NOT be distributed to ANY third parties PERIOD. So, do not hesitate to submit your entry, the prize is well worth it. Which species of tree is among the first to bloom with the arrival of spring in Greece? What herb was fashionably worn behind the ear by men at ancient Athens? What was the name and profession of the very first Olympic victor? What is the second oldest existing wine in the world? How much did my father’s prize tomato weigh last summer? Which famous British actor is especially fond of a rare Greek island specialty sweet? Which hospital was my son born in? There you have it; I look forward to your entries. I could have made it easier to win the prize in the hopes of getting more submissions, but I believe that the best things in life are earned, to some degree anyway. The rest is simply up to blind fortune. Such is life, my friends.